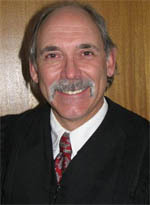 Judge Walker was appointed in July of 2007. Prior to his appointment, he served as a district and county court magistrate for 10 years in the 22nd and 6th judicial districts. Prior to his judicial service, he was in private practice for 20 years, 13 of which included serving as the prosecutor in the Southern Ute Indian Tribal Court. Judge Walker’s caseload includes civil, domestic, probate, criminal and juvenile cases.